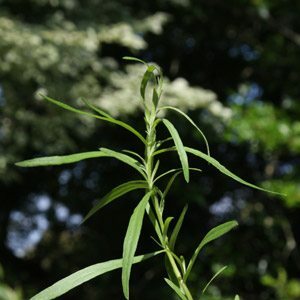 Tarragon plants and seeds for home vegetable and herb garden are popular, but remember the one you want is the French Tarragon. Fresh tarragon (see picture right) is a wonderful addition to many dishes and plants can be grown in the herb garden from seeds or seedlings. The French variety can’t readily be grown from seed, so why is this variety the best one? With 4 types of this herb offered for sale Spanish, Mexican, Russian and the one you are looking for is the fourth type. French Tarragon with its finer leaves, and the real peppery or aniseed ‘Tarragon’ taste is it so difficult to find. This is a variety that rarely flowers, and therefore does not set seeds, it has to be propagated by cuttings, so its a little more difficult to grow in bulk. However once you have it in the garden it is easy to grow and it is happy in a container. We grow out plants in a container, they have been long lived and require little care other than some added fertiliser each year. We only use the leaves, however the plants can be divided every few years. Tarragon needs a moist but very well drained soil, we suggest growing in a pot with plenty of gravel in the bottom. Make sure drainage is good, especially in winter, and protect from frosts. regular watering with seaweed fertilizer seems to be adequate as a fertilise. Plants will reach around 40 cm in height and spread to around 40cm as they form a clump. Growing from seed is possible, however the seeds are very difficult to find. Usually the French variety is propagated form cuttings or by division and sold as tubestock. This is a herb that is widely used with chicken and fish. It is also used in sauces, to make tarragon butter and it also pairs well with mushrooms and eggs. The best taste is when the herb is picked and used immediately, and this is why yo would want to grow your own French Tarragon. Tarragon Plants (ask for the French variety) are often available in spring from the following nurseries.